Cannes is an attractive coastal town and resort in the heart of the French Riviera, on the Mediterranean coast of south-east France. Since the end of the 19th century, and perhaps even more so than any other Cote d'Azur town, Cannes is associated with the rich and famous. This is in part due to the prestigious annual Cannes Film Festival and its celebrities photographed here in the sunshine with a palm tree backdrop. 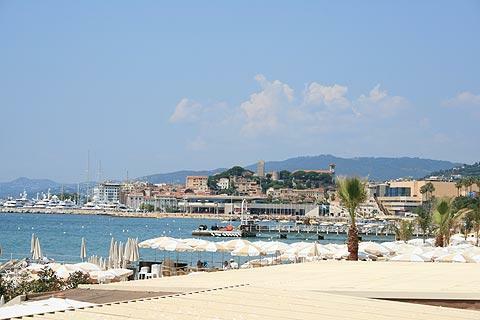 This image of the resort is not far wrong - Cannes does attract the jet-set and the rich and famous, and the city reflects it. 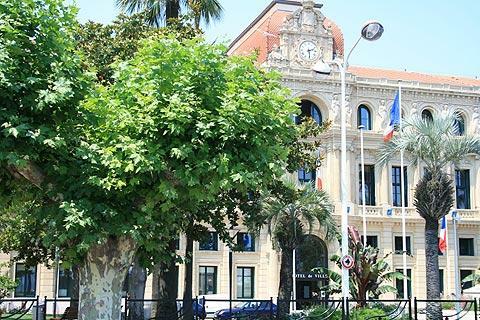 Start your visit in the main harbour area in the centre of Cannes. Situated along the sea edge the harbour glitters with the reflections of the sun from the many yachts harboured here. 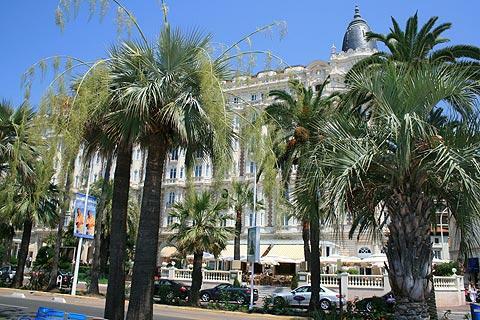 Walk a bit further along this coastal section and you are on the famous Boulevard de la Croisette. The Boulevard de la Croisette, along the coast in the centre of Cannes and as far as the southern tip of the Cap de la Croisette, is the central promenade in the town and 3 kilometres long between the town and the beach. 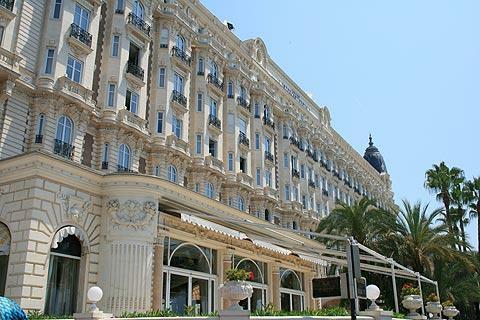 You will find the Cannes Tourist Office towards the western end of the boulevard. 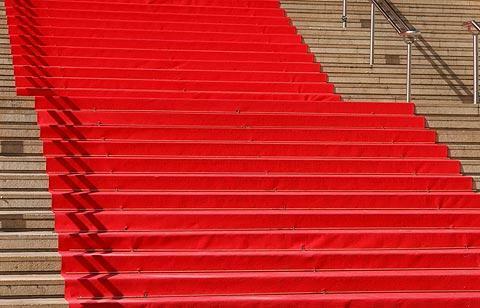 The Palais des Festivals, location of the Cannes Film Festival, is on one edge of the boulevard and you too can have your photo taken on the famous steps of the Palais. Unfortunately they hadn’t rolled out the red carpet for us! On the floor nearby you can see the tiles with the hand prints of famous stars such as Clint Eastwood and Bruce Willis and hundreds of others. Called the Chemin des Etoiles ('path of the stars') these can be seen near the Palais des Festivals and along the Esplanade Pompidou as well as in the gardens here. Continue down the Boulevard de la Croisette and there is a long sandy beach, though much is taken up by private beaches belonging to the expensive hotels on the other side of the road. All along the boulevard there are lots of designer shops interspersed amongst the hotels. 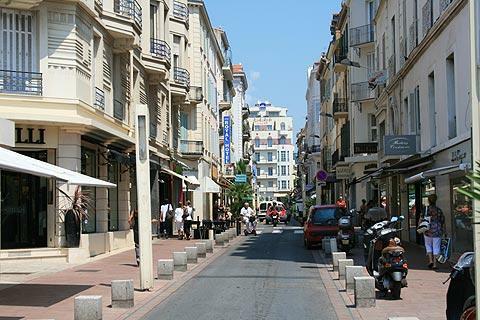 Just behind the Boulevard de la Croisette is the Rue d’Antibes which also has an amazing concentration of designer shops. It is a wide and pleasant street and a lovely place for a bit of window shopping, or real shopping if you are richer than us. There are also a lot more affordable shops here as well. Back beyond the old port and harbour walk steeply upwards and on to the hill known as Le Suquet, the oldest part of Cannes. 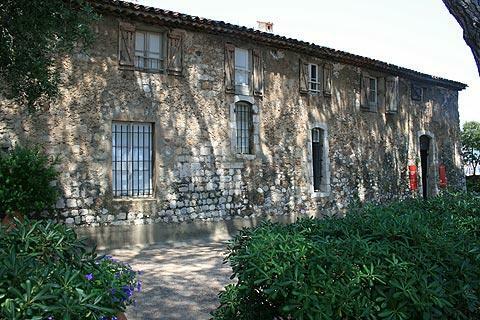 This is a very picturesque part of the town with narow streets and steep staircases between the ancient houses. 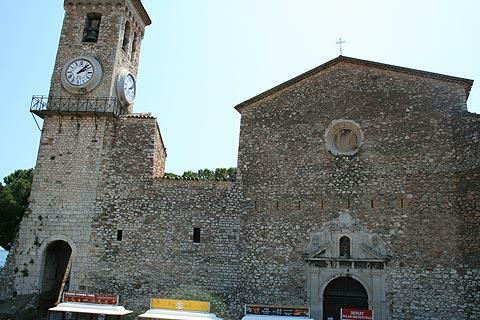 On the summit of the hill are the remains of a priory and the Chapel Saint Ann which is now home to the Musée de la Castre. 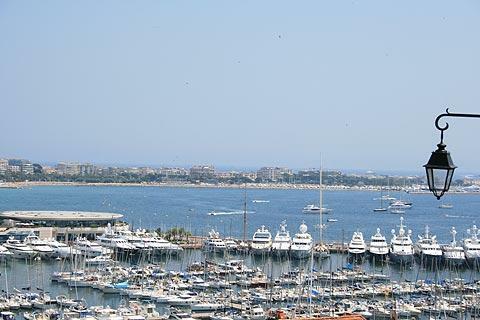 The views from here over Cannes, and the harbour and beaches are fantastic. Behind the rear of the old port the Allées de la Liberté is an attractive open space where the Cannes flower market is held. Keep drifting west from here through the old town to the main market, the Marche Forville, and narrow streets lined with boutiques full of things you probably can't afford. 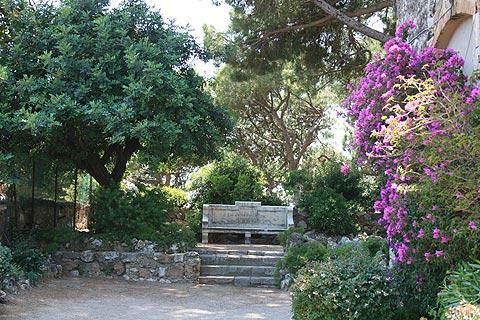 After exploring the centre of Cannes we suggest you visit the gardens of the Champfleuri Park on Roi Albert Avenue de la Favorite. These extensive and beautifully maintained gardens contain a very wide range of garden styles and water features and were inspired by various gardens around the world. 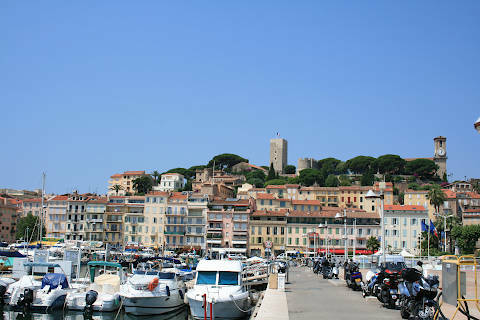 From Cannes you can take a 15 minute ferry ride to the lovely Iles de Lerins. One of these, the Ile Sainte-Marguerite, once held a prison where the ‘Man in the Iron Mask’ was locked up. Note: the 'man in the iron mask' was an unidentified prisoner detained for 30 years at the end of the 17th century. Forced to always wear a mask his true identity was never known, although he was said to be the illegitimate son or brother of King Louis XIV. He was immortalised in the Three Musketeers by Alexandre Dumas. 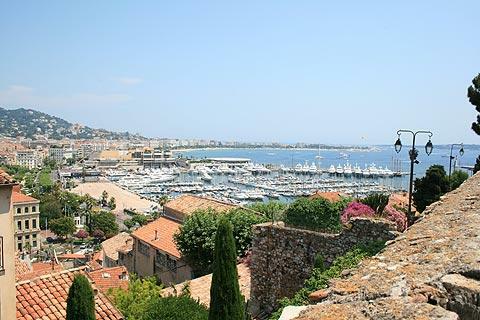 There are various other Riviera resorts along the coast here, of which our favourite is Antibes to the north-east of Cannes and the chance to explore the Cap d'Antibes at the same time. We also recommend you head north to explore the countryside. 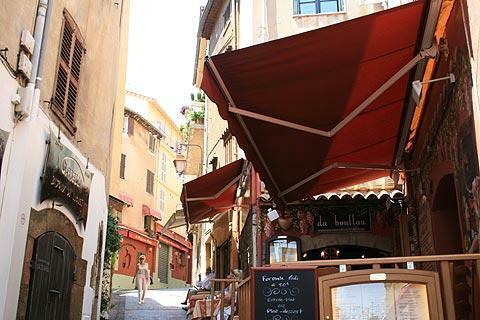 The pretty village of Mougins and the traditional Provençal town at Valbonne are both very enjoyable to visit. A seasonal market is held in Cannes on Monday.